Composition — Compositional Rules, Compositional Language, Types of Balance, Attracting or Switching the Center of Interest. “This is really one book that will be read and referred to throughout my professional career as a camera operator for film and electronic cinematography.” Jesse N.
The simple truth is that if you do not know filmmaking rules you will not make an interesting film. After you’ve mastered these rules, then you can break them. This book is all about filmmaking technique. It was written in 1965, yet none of its information is out-of-date. The book is not about technology. It’s about technique. This book covers the principles in a way that no other book does. One of the most important principles is Center of Interest, and that’s something all storytellers need to master. Despite what many amateurs and even some professionals think, technology does not make your film good, it just makes it easy. Technique is what makes it good. 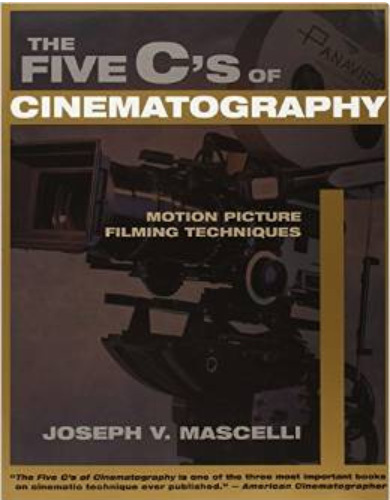 This first paperback edition of The Five C’s allows Mascelli to reach a whole new generation of filmmakers with his timeless insights into the fundamentals of filmmaking. If you want to learn cinematography, start with this book. Joseph V. Mascelli is an highly respected cinematographer who has filmed theatrical features, documentaries, training films, television commercials and television series. He wrote extensively about camera work for photographic magazines and trade journals, was an editor of the American Cinematographer Manual, and lectured on cinematography at Loyola University of Los Angeles.